click on the cover image below. 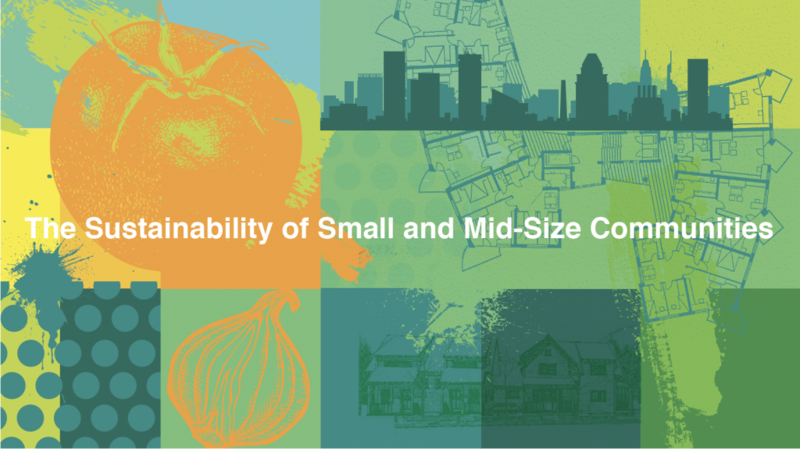 City Managers and Sustainability Directors of the Big 10 Conference will meet in Lincoln August 1–3 to discuss and learn about affordable housing and food systems as drivers of economic and socio-cultural growth and development, among other issues. The Joslyn Institute for Sustainable Communities is hosting the conference, to be held at the Embassy Suites in Lincoln. Iowa City City Manager Geoff Fruin will present successful case studies from each of the Big 10 cities, scaleable and transferrable programs, policies or initiatives related to the overall theme of the conference. Participants will also take a Star Trans tour of the city, led by Ed Zimmer, City Planning Department Preservation Planner, and will share a meal at farmer-owned local foods restaurant Prairie Plate. W. Cecil Steward, President and CEO of JISC, will give a presentation on the use of Sustainometrics®, the Joslyn Institute’s proprietary tool for planning, design and assessment of sustainability indictors for projects small and large, and representatives of South of Downtown will talk about that organization’s work to create a more vital, vibrant neighborhood through affordable housing and workforce development. For 24 hours, on Give to Lincoln Day, every donation given to local nonprofits is made bigger by matching funds.It is one special day when everyone in Lincoln is asked to make a donation showing their support for the organizations that contribute so much to our great city.The Joslyn Institute will participate in this annual day of giving. Come to Tower Square on 13th & P streets from 10 am to 2 pm and visit our booth, a chance to make your donation in person! Or donate online here: givetolincoln.com/nonprofits/joslyn-institute-for-sustainable-communities Every donation given makes a bigger impact because nonprofits also get a proportional share of a $400,000 challenge match fund provided by Lincoln Community Foundation and their sponsors. On May 31st, gifts can be made to participating nonprofits online at GiveToLincoln.com from 12am to 11:59pm, or in person at one of the donation stations. Minimum donation is $10. Donations can be given online in advance, starting May 1. Gifts made between May 1 and May 31 will be counted in the dollars raised on Give to Lincoln Day and qualify for matching funds. Due to a combination of factors, our Urban Thinkers Campus 2.0, originally scheduled for August, has been postponed. We have immediately begun planning and reassessment to reschedule this UTC for a date in 2018. We will keep you informed as this planning for our original goals, partnerships, and programming continues. “It’s cool. It’s spectacular. It goes dark. You can see stars in the middle of the day. I know everybody talks about it, but it really is very much out of your everyday experience. It’s weird and very exciting.” Bill Nye the Science Guy and the Planetary Society will be among the thousands of sky gazers visiting Nebraska to view the total solar eclipse on August 21. Nye and his group will be in Beatrice at Homestead National Monument, but there are nearly limitless places across Nebraska that will be prime viewing locales. The eclipse will traverse the entire state. While total solar eclipses are hardly rare—there are one or two every couple of years—this will be the first to travel across the United States since 1776. Nebraska is in the center of the path. The Joslyn Institute for Sustainable Communities proposes to find common ground among a select number of universities and their host cities in its Urban Thinkers Campus (UTC) 2.0, to be held in Lincoln August 24–26, 2017 at the University of Nebraska–Lincoln’s Innovation Campus. Registration is now open for the conference. Click here to register. Cities are the vanguard in addressing immediate effects of climate change, population migration and growth, and infrastructure modernization in the United States. Amidst a general atmosphere of federal and state political deadlock, cities now face frontline and more urgent demands with fewer resources to address them. Universities, on the other hand, are virtual laboratories of Big Data, technological breakthroughs, and innovative sustainability research and modeling. The Roles and Opportunities for Small and Mid-size Cities in Town/Gown Relationships: Actionable Urban/Rural Planning for the New Urban Agenda is the topic of the conference. Lincoln Mayor Chris Beutler and UNL Chancellor Ronald Green, along with Joslyn Institute President and CEO W. Cecil Steward, will host mayors, university administration representatives and other decision leaders from among the 14 cities and universities of the Big 10 Athletic Conference to discuss and lay the groundwork for how these universities and their host cities can collaborate, support, and strategize for long-term sustainability, resilience, and high qualities of life in the upper Midwest and Northeast areas of the U.S. The August UTC 2.0 conference is intended to be the second of at least two more, following on a format developed for the JISC’s highly successful first Urban Thinkers Campus in November 2015. UTC 2.0 will have a series of concurrent focus group “conversations”, each centered around such strategies as shared learning, communications, data and metrics, research and innovation, among others. University/city, university/university, city/city, urban/rural, university/city/rural connections and interdependencies will inform the explorations. Town/Gown relationships have been sometimes adversarial since the Middle Ages, and often disassociated enterprises, in part because of their divergent priorities and different governing systems. Today, such relationships can be not just conciliatory but fruitful collaborations. A recent federal effort to promote greater collaboration established the MetroLabs Network in 2015, with incentives for the development of “smart city” and high-tech projects in a number of selected city/university partnerships to address such issues as transportation, housing, wage inequality, energy, and more. The Joslyn Institute’s Urban Thinkers Campus 2.0 goes far beyond the “smart city” concept to embrace not just technological collaborations, but to include four other domains of sustainability: socio-cultural, environmental, economic and public policy. A major goal of the UTC 2.0 will be to utilize UTC 1.0 recommendations, the Paris Climate Agreement, UN–Habitat’s Sustainability Development Goals, and the recent Habitat III New Urban Agenda report as foundational materials for the conference, considerations of a long-term consortium of the 14 Big 10 universities and their home cities. Learn more about the August Urban Thinkers Campus on the website here. The Joslyn Institute for Sustainable Communities (JISC) will employ this hashtag to post social media communications links, news and information resources, and current event reports on research, practices, and innovations on Supply, Demand, and Community Assets that promote production and markets for local foods and local products. Our goal is to provide Lincoln and Southeast Nebraska citizens with current, reliable, and sustainable information on the growing and consumption of local Nebraska foods and quality of life-enhancing products. Throughout America, and historically among many international communities and cities, the production on local and regional farms, and the marketing and consumption of local foods within public markets in communities, neighborhoods, and cities has become a major public health, economic and cultural enterprise. Local foods and food systems have become key developed elements of any city seeking the highest profiles of quality of life and sustainability for families, institutions, and businesses. Issues of safety, nutrition, equitable access, economic value and financial impacts, 12-month access to fresh and processed local foods, conservation and environmental protection of Nebraska’s natural resources, and the impacts of food on cultural and community diversities will be topics of the JISC social information programs. We intend to be a bridge of consolidated and interrelated information with digital links to existing organizations and information sources on food, gardening, agricultural, culinary and restaurant services, markets and public events, as well as interrelationships of new quality of life information sources on locally produced arts and crafts, entertainments, and community learning opportunities. We will also report events and activities from existing urban public markets concerning their history and sustainability as well as public markets and agri-tourism. JISC is encouraging all interested individuals and organizations to join us in getting out the word. Please LIKE us on Facebook https://www.facebook.com/LincolnPublicMarket/, and FOLLOW us on Twitter https://twitter.com/LincolnPubMkt. And please feel free to liberally use the hashtag #LincolnPublicMarket when posting articles about Nebraska local foods, food production, and related topics. The more, the better — for sustainable local foods! The World Urban Campaign this week announced the approval of the Joslyn Institute’s plan to host an Urban Thinkers Campus 2.0 in August. JISC’s Urban Thinkers Campus in November 2015 was seen as a definitive success, with its emphasis on sustainable development in small and mid-size cities. JISC’s planned conference will again focus on small and mid-size cities—specifically those where Big 10 university campuses are located—and how these communities can be active learning communities, collaborating with their resident universities on interdisciplinary knowledge bases, and applications strategies, for comprehensive sustainable development. JISC’s Urban Thinkers Campus is the only U.S. conference approved so far. Partners for this UTC will be the cities and universities of the Big 10, among others. Updates as to specific dates and location for the conference in Lincoln are forthcoming as planning gets under way. Visit the website, which is continuously adding resources and information from now until the August conference. The Joslyn Institute for Sustainable Communities held observances on November 5 celebrating our 20th anniversary. Founded in 1996 by W. Cecil Steward, JISC’s work has encompassed micro projects—such as teaching City Planners how to use sustainability metrics in planning, and rehabilitation of the Joslyn Castle—to projects that extend across the state and around the world—such as our Nebraska Sustainability Leadership Workshops and Conversations Conferences, in which nearly a thousand Nebraskans were engaged, and our Urban Thinkers Campus, where nearly 200 people from nations around the world took part in making decisions about The City We Need for UN–Habitat. JISC is a tiny organization with great reach and impact. Our work has taken us to Valentine and Norfolk, Scottsbluff and Nebraska City, and internationally to China, Inner Mongolia, Medellín, Nairobi, and Dubai, where we were presented with a Best Practices Award. Our Board of Directors has been refreshed with new people and ideas. The new board met prior to the 20th Anniversary Open House to discuss projects that have reached completion, the status of current projects, and projects in planning stages. In addition, the Board is considering next steps for the Joslyn Institute, how it might grow and change. After the Board of Directors met, a festive Open House was held at the home of Cecil Steward, where we were joined by many friends, supporters, and colleagues. In this, our 20th year, we have moved our main office to Lincoln, where new Program and Office Manager Donna Woudenberg keeps things running. We have a new logo, and we launched our new website—designed to work on mobile devices, as well as computers. These are all indicators that the Joslyn Institute for Sustainable Communities is getting ready for the next 20 years. Click here to view a slide show of images from the board meeting and open house. The Joslyn Institute for Sustainable Communities announced that it will receive $125,000.00 from the Nebraska Environmental Trust (NET) for its “Sustaining the Conservation of Nebraska Environmental Resources (SCNER)” project. The NET Board announced funding for the project at its meeting on April 7, 2016, in Lincoln. The project is one of the 118 projects receiving $18,799,900 in grant awards from the Nebraska Environmental Trust this year. Of these, 69 were new applications and 49 are carry-over projects. The JISC project is a carry-over project, having begun last year. The SCNER project comprises an annual series of public lectures, workshops, conferences, and distributed information on applied practices with emphases on the following priority categories of the NET: habitat, surface and ground water, waste management, air quality, and soil management. Through strategic communications design for conservation and sustainable development, the project includes public lectures by national and Internationally recognized specialists, in partnership with the Hyde Lecture Series at the College of Architecture at University of Nebraska-Lincoln (UNL); the Sustainability Leadership Presentation Series—JISC’s presenting sponsorship collaboration with Central Community College, UNL and Metropolitan Community College for monthly statewide webcasts of presentations by experts on all aspects of sustainability; production design of an annual Nebraska Ecospheres Conference to focus on barriers, issues, and potential progress across the state with a focus on conservation and sustainable development; establishment of an annual public awards and recognition program for successful applications of conservation and sustainable development practices; and production design of both a digital and analog library of transformative and transferable information on statewide resources for conservation and sustainable development. The Nebraska Legislature created the Nebraska Environmental Trust in 1992. Using revenue from the Nebraska Lottery, the Trust has provided over $250 million in grants to more than 1,900 projects across the state. Anyone—citizens, organizations, communities, farmers and businesses—can apply for funding to protect habitat, improve water quality and establish recycling programs in Nebraska. The Nebraska Environmental Trust works to preserve, protect and restore our natural resources for future generations. The possibility of establishing a regional food hub in Lincoln’s Pershing Auditorium has been the subject of a feasibility study by the Joslyn Institute and a number of partners over the past year. The findings of that feasibility study have been made public. Click here to view the report in PDF form. W. Cecil Steward, President and CEO of the Joslyn Institute, has presented the findings to City of Lincoln Mayor Chris Beutler and other city officials. The Southeast Nebraska Food Hub proposal is intended to consider an public/private, interdependent, comprehensive strategy that addresses environmental, socio-cultural, technological, economic and public policy opportunities and consequences. Its sustainability requires that these factors— or domains—be considered in planning and development. JISC partnered with more than 50 organizations, businesses and individuals in conducting the study, including Nebraska Cooperative Extension, UNL Rural Futures Institute, Nebraska Farmer’s Union, Clark Enersen Architects, the City of Lincoln, Nebraska Investment Finance Authority, Lincoln Local Foodshed Working Group, Community Crops, Buy Fresh/Buy Local, and many others. The proposed demolition of Lincoln’s Pershing Auditorium has been an additional catalyst for the timing and direction of the Southeast Nebraska Food Hub feasibility study. The building’s important location, cultural and historic attributes, and overall good condition bring it to the forefront in consideration as a location for a multi-use structure including a year-round public market, as well as housing for many of the proposed Food Hub’s activities. Through a process of charrettes organized by JISC, Clark Enerson Partners architectural and engineering firm, drew plans for retrofitting and rebuilding Pershing Auditorium and its environs that include greenhouse, “artist loft” housing units, community information and services center, restaurants, offices, year-round public market, distribution and processing center, storage, specialized food processing kitchens, parking, outdoor festival/events/dining spaces, and a state-of-the-art high tech power plant that both provides energy for the specialized needs of the food-centric areas of the facility and also feeds the energy needs for the neighborhood. Estimates are that by keeping Pershing Auditorium out of the landfill, more than $2 million in demolition costs and $2 million in tipping fees will be saved. In addition, a number of Lincoln residents want to save the mosaic mural on the façade of the structure; if the building were demolished, it would cost an additional $2 million to preserve it. Co-ops and CSAs, individual small and young farming concerns and well-established large producers, composters and low-income food pantries, and ethnic communities and regulators/government entities and waste management may have different needs and aims. But a food hub can be a source of information, resources, ideas for new revenue streams, a catalyst and proving ground for policy, and innovative channels for all of these. A food hub is not a public market, nor does a public market require a food hub, but a food hub could enhance the public market in myriad ways. Well-established corporate farms may already have their own processing and distribution channels, but a food hub may act as a resource to their finding new markets, economies of scale through connection with other similar producers, among other resources. The three charrettes JISC convened in conducting the feasibiilty study discussed ownership, leadership, management, responsibility and how a food hub centered around Pershing Auditorium might operate. A regional food hub could be instrumental in bringing together such a varied group of stakeholders with divergent needs and goals, coalescing and strengthening the concept, impact and necessity of local foods in Nebraska generally. The Joslyn Institute is joining forces with High Level Happiness in an endeavor to help Lincoln become the first Community Treehouse City in the United States. According to Carolyn Butler of High Level Happiness, “The city of Lincoln is among the top five in the nation on lists ranging from businesses and careers to health and happiness. We are active, engaged, and ready to take the number one spot for overall quality of life. The time is right, then, to add depth to our city through a creative endeavor that will draw national and international attention. High Level Happiness proposes building ten large, multifaceted treehouses throughout the city. Each treehouse will be an original design that highlights aspects of Nebraska—our people, our passion, and our history. What better symbol could the city of Lincoln have to represent who we are and what we strive to be?” JISC President and CEO will assist the initiative by helping with the national and international treehouse design contests. For further information on High Level Happiness, community treehouses, and why they are a growing force, click here to read the PDF. Click here to read the article by Nancy Hicks in the Lincoln Journal-Star. Once a niche business, locally grown foods aren’t just for farmers markets anymore. Across the country, growing networks of companies and organizations are delivering food directly from local farms to major institutions like hospitals and schools, and businesses like restaurants and groceries, eliminating scores of middlemen from farm to fork. Along the way, they’re increasing profits and recognition for smaller farms and bringing consumers healthier, fresher foods. Over the past five years, with more than $25 million in federal aid, these so-called food hubs have helped transform locally-grown foods into a bigger business, supplying hospitals, schools, restaurant chains and grocery stores as consumer demand grows. Along the way, jobs in processing, marketing and distribution are created. 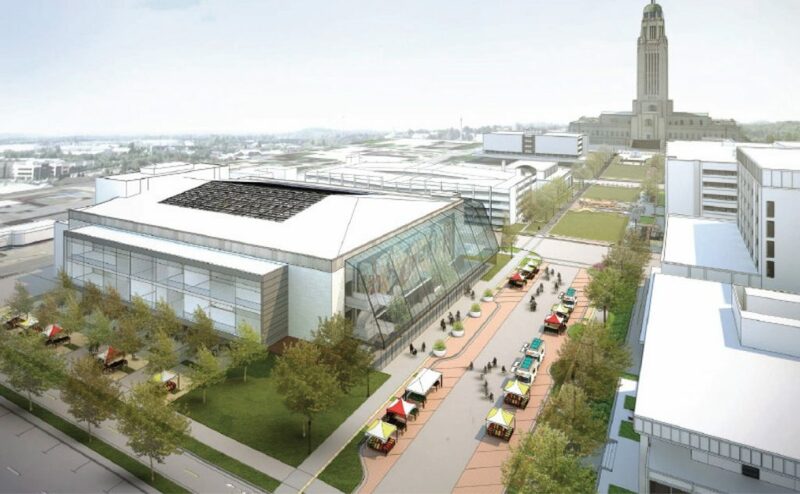 The Joslyn Institute for Sustainable Communities, along with a number of other stakeholders, has begun exploring the idea of undertaking a feasibility study for a food hub in Lincoln. The proposal would include the possible retrofit of Pershing Auditorium as the physical location of the Southeast Nebraska Food Hub. JISC is working with Nebraska Cooperative Extension, UNL Rural Futures Institute, Nebraska Farmer’s Union, Clark Enersen Architects, the City of Lincoln, Nebraska Investment Finance Authority, Lincoln Local Foodshed Working Group, Community Crops, Buy Fresh/Buy Local, and others to explore conducting the feasibility study. What do construction waste, global population migration, food processing and distribution, the Ogallala Aquifer, Omaha and O’Neill, climate change, and economic development have to do with one another? A new video by the Joslyn Institute for Sustainable Communities shows how interconnected and interdependent all of these factors are, and how addressing the nexus of global and local changes and pressures on our critical resources will ensure a strong and healthy future for our citizens. Nebraska Nexus: Resources, Conservation, Development and Change explores five critical resources—food, water, energy, land and materials, and how we must consider both conservation and development of those resources to respond effectively to global pressures and to ensure they remain sustainable for future generations and the high standard of living we now enjoy. The culmination of four years of highly interactive workshops and conferences with civic leaders, ranchers, farmers, elected and appointed officials, students and concerned citizens across Nebraska, the video was produced with the support of Humanities Nebraska and the Nebraska Environmental Trust, with the administrative support of Nebraska Academy of Sciences. Nebraska Educational Television will premiere the video on Thursday, May 29 at 7 pm CDT on NET2 World and will air again on Sunday, June 1 at 1 pm also on NET2. The program will repeat on NET Connects on NET2 at 6 pm, Thursday, June 12, and at noon on Sunday, June 15. After mid- June, the 1 1/4-hour video will be distributed throughout the state and will be available online on demand for appropriate college and high school classrooms with accompanying teachers’ guides, and to Educational Service Units, public and school libraries, service agencies, civic organizations, governmental bodies and others. Change and the pressures and facilitation change can bring are a common denominator everywhere, the movie points out. Earth and its systems are constantly changing. Some changes are cyclical and familiar; others are propelled by human ingenuity; others still are altogether unpredictable. These changes present both challenges and opportunities for Nebraskans, the video demonstrates. Exponential population growth of humankind taxes the earth’s capacity to support our species. Today there are more than 23 megacities exceeding 10 million inhabitants. By 2025, there will be a total of 37 megacities, as compared to only 2—New York City and Tokyo—that existed in 1950. Increasingly, the quality of life in our cities will be synonymous with quality of life generally. And yet we’ve never been more dependent upon the continued success of rural America. Our rural communities provide the natural resources we depend on not only for food, water, and energy, but also for our forests, recreation, and national character. The connection between rural Nebraska, its communities, and the world’s megacities is certain. Where there are cities, there is great demand. This demand knows no boundaries; it has critical bearing upon our own state’s natural resources, its agriculture, and its people. Worldwide, population growth and developing markets drive local economies and redistribute the bounties of our agrarian communities. Over one-quarter of Nebraska’s economy is tied directly to the export of resources generated by its robust industrial agricultural complex. Conservative estimates of current consumption habits suggest that it now takes the Earth one year and six months to regenerate what we use in a year. By 2050, it is projected that humanity will require the equivalent of 5.3 earths to provide the resources we use. And yet not all resources regenerate. Even those resources that are renewable may not regenerate quickly enough to keep pace with demand. Precious metals and fossil fuels are routinely wasted, even as they become increasingly difficult to extract from the earth. Not coincidentally, the extraction and use of these resources contribute to climate change. 2012 was the ninth hottest year ever recorded on earth. Of the nine hottest years, eight have occurred since the year 2000. Here in Nebraska, climate change is already impacting our growing season—for now, lengthening it. The advantage this confers may prove temporary. It is anticipated that within a few decades the nation’s breadbasket will be prone to migrating growth seasons, extreme droughts and flooding, capable of disrupting global food supply. It may be impossible to raise corn here in the future. These are global questions with local solutions. They are questions facing Nebraskans across the state, and a range of responses, ideas, and answers to these questions are what Nebraska Nexus explores. OMAHA — The Joslyn Institute for Sustainable Communities (JISC) has announced partnerships with groups in Minden, Broken Bow and Lincoln in its new grant-funded program to help foster and facilitate targeted communication strategies and deliberative, democratic decision-making surrounding specific issues in which each community is now involved. The two-year program, funded by the Nebraska Environmental Trust, is headed by Dr. Jay Leighter, Associate Professor of Communication Studies at Creighton University and a member of the JISC board of directors. After a series of discussions about the aims of the project with leaders and stakeholders across the state, these three communities agreed to join JISC as collaborators in the project. The three communities—Minden, Broken Bow, and Lincoln—have distinct geographical and demographic differences, with different sets of issues and with varying capacities in place to address such issues. In Minden, JISC will work with the City of Minden and City Administrator and Finance Director Matthew Cedarburg to address citizen concerns about high electric utility rates. This recurring issue is an opportunity for communication strategy facilitation, according to Leighter. How residents understand the concept of energy has bearing on how receptive they are to accessing the programs that may benefit them most. JISC’s project is also attempting to connect with ongoing sustainability efforts in the region. Minden is already a participant community in a Nebraska City/Council Management Association (NCMA) project seeking funding to assess opportunities for low-energy housing. If funded, the results of Joslyn Institute’s partnership will give Minden a jumpstart on projects such as the one led by the NCMA. In Broken Bow, JISC, in partnership with WasteCap Nebraska, will work with Broken Bow’s Green Coalition as it works to build support for Zero Waste in the community. What does the community regard as waste and how can its residents be persuaded to begin to understand waste as a resource? The goal of the partnership with WasteCap Nebraska is to facilitate community-wide education on waste streams and, potentially, begin to implement long-term waste reduction plans. If successful, this program also has the possibility of being utilized in other Nebraska communities. Lincoln already has a robust, priority- and outcome-based budgeting process, Leighter said. Six years ago, the City of Lincoln began a long-term commitment to move toward an outcome-based budgeting process. The 2013 Taking Charge Budget final report, which had input of citizens, identifies and assesses priorities and performance criteria that will provide a basis for the City’s biennial budget decisions. In addition, a 2012 effort to develop Lincoln’s first sustainability plan, led by the City’s Blue Ribbon Leadership Team, identified a series of sustainability indicators and measurable targets, many of which complement outcomes sought in the Taking Charge budget process. 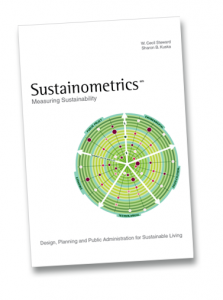 In developing the sustainability indicators and targets, the team and Milo Mumgaard, Senior Policy Aide for Sustainability for Mayor Chris Beutler’s office, were influenced by JISC’s SustainometricsSM and EcoSTEP® methodologies for design and planning in sustainable ways. The Rural Futures Institute (RFI) at University of Nebraska–Lincoln (UNL) is working with JISC in the strategic communications program in Minden and Broken Bow. Dr. Randolph Cantrell, Extension Professor, is spearheading the effort for RFI. His experience in working in and with communities throughout Nebraska has provided strong insights into the varied issues faced by rural and urban populations, geographic and demographic differences, and also what common threads and interconnections exist among them. “Sustainability issues are found in both large urban and smaller rural communities,” said Cantrell. “However, the communication that occurs around those issues is likely to be very different for two reasons. “First, while urban centers such as Lincoln are likely to have administrative departments committed to an environmental or other sustainability issue, rural places are not,” he explained. “In rural places, those communications are much more likely to fall to an individual or group—often volunteer—with limited resources in time and expertise to commit to the task. Leighter agreed, saying, “Each problem/opportunity in the quest for sustainability is a local matter and thus requires a distinctive understanding of what will work in a particular place at a particular time.” He anticipates the program will result in innovative and robust best practices that may help to build capacity for deliberative, democratic communication that increases understanding and enhances positive community attitudes in towns and cities across Nebraska. That, he said, would go a long way in determining how communications influence sustainability. To see older news stories, please visit our News Archives.